← Why was the beggar Lazarus in Abraham’s bosom? Killing Christians: persecution of Christians is worse than ever, so why is the Church growing? Even in the midst of persecution, the church is growing. He is coming soon! >> Join me for a discussion of Christian persecution in the Mideast during a special simulcast on April 19th. We are living in a time of unprecedented persecution of Christians in the Middle East and around the world. The Lord Jesus warned His disciples that they would be persecuted, and that persecution would intensify as the time of His return drew near. Today, we are seeing His prophecies come to pass as never before. 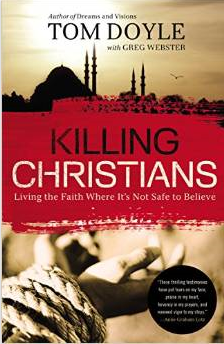 Recently, my friend, Tom Doyle, published an important book titled, Killing Christians: Living The Faith Where It’s Not Safe ToBelieve. Tom not only describes the general wave of brutality against Christ-followers worldwide; he also tells specific, personal stories of believers boldly standing for their Savior — and courageously proclaiming the Gospel of forgiveness and eternal life — amidst such persecution.